Climate change helped produce the blizzard of 2016. Children are pulled home after playing at Riverside Park, which was covered in snow after a day of constant snowfall in New York City on Jan. 23, 2016—the city’s snowiest day ever. As the Northeast digs out from a record-breaking blizzard, it’s safe to move beyond forecasts and precautions to wonder: Did climate change play a role here? The answer, quite simply, is yes. Now, of course, that’s counterintuitive. Global warming isn’t supposed to make it snow more, right? Well, on the whole, averaged over many cities and many storms for several decades, you’d be right. Total snowfall and total snow cover are decreasing across North America, a trend that’s expected to continue. But there are several factors related to climate change that are almost assuredly increasing the chances for mega-snowstorms, like the blizzard of 2016, at the same time. This weekend’s storm was a perfect example of the weird new atmosphere we’ve made for ourselves. As a New Yorker said this weekend, “what a time to be alive.” Saturday was the snowiest single day in New York City history, as 26.6 inches fell. The storm’s fury was concentrated in the city, where JFK Airport experienced the worst conditions of anywhere on the East Coast—though not quite enough to bury the airplanes in snow, as one meme suggested. The mood, even in the hardest hit areas, was mostly festive. After hunkering inside to avoid the wind-driven snow on Saturday, massive snowball fights, sledding, and just general leaping into the snow occupied the day on Sunday, with stunningly beautiful photos streaming in from across the region. In D.C., the soundtrack from Disney’s Frozen blared from a police cruiser. That’s not to say the storm came and went without incident: In Kentucky, thousands were stranded in a massive traffic jam on Interstate 75, and on Monday, the federal government in D.C. remained shut down. The New York Times reports at least 28 people have died across the East, most from traffic accidents, shoveling overexertion, and carbon monoxide poisoning. In D.C., the National Guard helped National Weather Service meteorologists change shifts by ferrying them in Humvees during the height of the storm. This weekend’s record water levels would not have been so bad without the melting of glaciers and ice sheets that global warming has already caused. For instance, sea levels are rising in the Northeast, and at Lewes, Delaware—one of the oldest cities in America and one of this weekend’s hardest hit by flooding—they’ve surged by more than a foot over the past 100 years. Winters are getting warmer pretty much everywhere, but at the same time, seven of the 10 heaviest snowstorms in New York City’s weather history (which dates to 1869) have now come within the past 20 years. A similar trend holds for D.C. and Baltimore. Something is clearly different recently. There are a lot of reasons for this, including a big boost from a very strong El Niño (and some other factors that are, frankly, probably either random chance or not well understood), but there is clear evidence global warming is boosting the odds of recent big Northeast snowstorms. Among the clearest is Physics 101: A warmer atmosphere is able to hold more moisture, and thus can produce heavier precipitation (whether rain or snow) in a shorter amount of time. At the moment, exceptionally warm waters off the East Coast (as high as 76 degrees Fahrenheit!) are boosting the amount of water vapor in the air by about 10 to 15 percent, according to Kevin Trenberth of the National Center for Atmospheric Research. Looking ahead to the forecast for the next few days, warmer than normal temperatures are expected to resume for the foreseeable future, meaning this snow—as heavy as it was—won’t stay around for long. And that, of course, is partly due to global warming too. 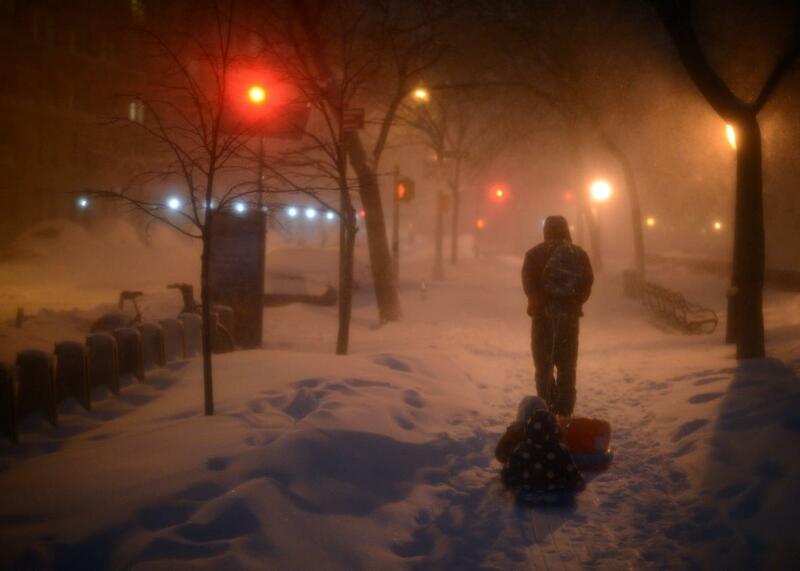 Read more in Slate about the East Coast blizzard.